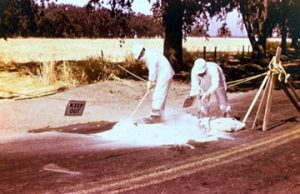 Proper cleanup of the spillage is essential to remove all health and environmental hazards created by the spill. Use the buddy system when cleaning, and do not work alone. Everyone must be wearing the proper PPE. Assure that there is good ventilation when cleaning and decontaminating the site. 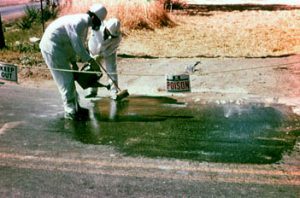 Cover the spill with plastic or a tarp to prevent a breeze from moving the material. Put weights on the cover. 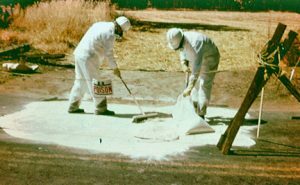 Use a broom, dust pan or shovel to sweep up the spill while rolling back the tarp to expose only a small area at a time. 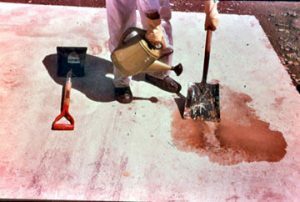 Place spillage in metal or plastic containers. Plastic bags may be used, but only as a last resort. Soak up the liquid with an appropriate absorbent. (sweeping compound, sawdust). Use a broom to work the absorbent into the spill. Gather the combined material and deposit it in a labeled plastic or metal container. 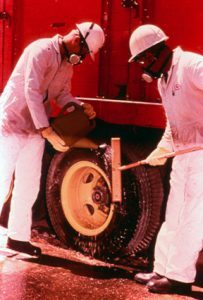 After the bulk of the spill has been removed, apply the appropriate decontamination material. 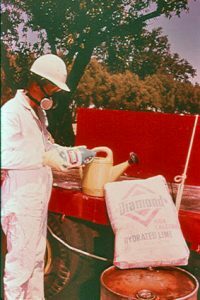 The material chosen depends on the pesticide spilled. Apply the appropriate solution and allow 1 to 6 hours for the chemicals to work. Use an absorbent to collect the residues. 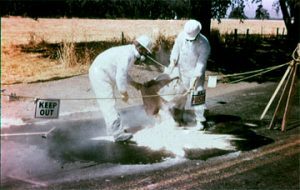 Dry decontaminants are sprinkled in a thin layer over the spill area. The powder needs to be activated with water. A watering can is used to wet the powder lightly. 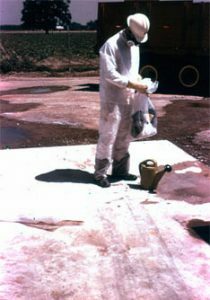 Liquid decontaminants may be applied lightly to the spill area with a watering can. 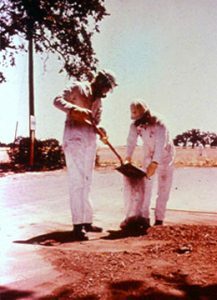 The decontamination procedure is repeated until all the spilled pesticide is removed. Tools are cleaned with soap and water or an appropriate decontaminant. Collect all used decontaminants and rinse water for disposal.